Retired Navy Master Chief Petty Officer Dewayne "Mac" McClaeb, 60, of Annapolis, died Sept. 16 at his home after a battle with cancer. 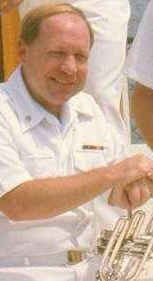 Master Chief McClaeb was born on Nov. 19, 1941, in Logansport, Ind. He joined the Navy in August 1960 as a musician. After a tour with the Navy Band in Pensacola, Fla., he reported to the Naval Academy Band in Annapolis in 1964 where he served as a trumpeter in the marching band, concert band and jazz ensemble. At the height of his career with the Academy Band, he led the Superintendent's Combo and was the band's Leading Chief Petty Officer, the highest enlisted position in the organization. He retired in 1990. He was credited as co-founder of "The Original Crabtown Stompers," which performed throughout the Annapolis area for 25 years. After retiring, he continued playing trumpet as a freelance musician performing with his own Dixie group, the Zim Zemarel Orchestra, the Doc Hochman Dixieland Band, the Barbone Street Jazz Band and the Peabody Ragtime Ensemble. He was a member of the First Baptist Church of Eastport and the Naval Academy Golf Association, an officer of Branch 24 of the Fleet Reserve Association and president of the Fairwinds Condominium Association. Master Chief McClaeb is survived by his wife, B.J. Doyle McClaeb, also a local musician; his son, Timothy McClaeb, and his daughter, Teresa McClaeb, both of Annapolis; and one grandson. Viewing will be from 2 to 4 and 7 to 9 p.m. tomorrow at Taylor Funeral Home, 147 Duke of Gloucester St. A memorial service will be at 11 a.m. Thursday at First Baptist Church of Eastport, 208 Chesapeake Ave. A graveside service will follow at 1 p.m. at Maryland Veterans Cemetery in Crownsville. In lieu of flowers, memorial contributions may be made to the American Cancer Society, Anne Arundel County Unit, 1041 Route 3 North, Gambrills, MD 21054.